If you want to take advantage of Analytics Canvas features that use our cloud platform, you need to create a user account. To create a cloud user account, you must either be the very first user in your subscription to register, or you must be an administrator, and can then invite a new user. 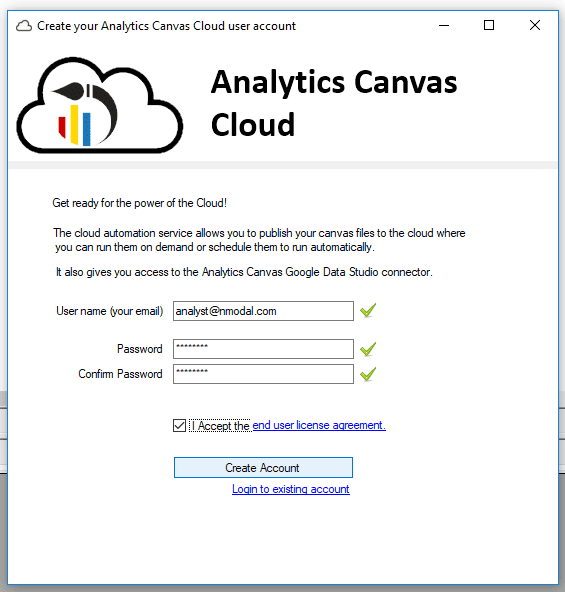 click on "Log in", or select any feature in Analytics Canvas that requires cloud access. You will be prompted to create a new user account. Enter in your email address, and create a password for your account. Read and accept the end user license agreement. This first user account will be the administrator by default. You can invite other users and grant them Administrator level access, and once there is another administrator, you can have them remove administrator access from the initial account if desired.